Leylandii is one of the fastest-growing hedging species we have available, growing by a staggering 75cm (2ft 6in) to 90cm (3ft) each year. Its rapid growth is the reason it sometimes receives a bad press. This is only as a result of its failure to be trimmed regularly. Leylandii is a superb choice for a good, windproof hedge affording privacy and lessening noise for surroundings. 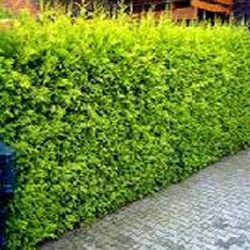 We have either gold or green Leylandii available and we leave it for you to choose which colour. Leylandii prefers either a sunny or partially shady position. Our Leylandii hedging trees are sold as containerised plants, in other words the roots are encased in compost. This means that planting can be carried out at any time of the year, provided they are watered in periods of drought, compared to bare-root plants which can only be planted during the plants normal dormant period (November to March) and secondly containerised plants have a higher survival rate than bare-root plants.